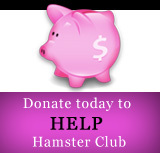 Hamster Club :: Adopt a Hamster! A Hamster lover named Ashlee, rescued two Syrian female Hamsters, who were pregnant and in total these two Syrian Hamsters gave birth to 21 hamster babies! These adoptions are for mainly people in the Northern VA/DC/MD area and who would be willing to drive whatever random distance to meet halfway to get their hamster! Anyone interested please send me an e-mail here. 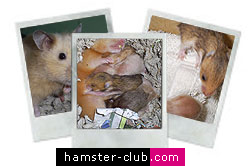 The oldest hamster litter is about three weeks old and the second hamster litter is a week and two days old. (March 2008). The colour of the baby hamsters' coat varies; some are dark golden hamsters, others cream syrian hamsters and also cinnamon syrian hamsters. These hamsters will NOT be given to people who intend to breed them....and will only be given to truly hamster lovers who wish to help these lovely creatures. Thanks, and I hope you consider taking one! 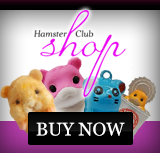 ADVERT CLOSED -- ALL HAMSTERS FOUND A HOME.